Currently on display in the Covington Convention Center. Community Participants: Bob Beloat, Elizabeth Berns, Linda Carter, Natalie Clay, Melissa Einhaus, Carol Gastright, Thomas Greene, Ida Haegele, Ben Hamm, Kathy Jaquish, Holly Kemble, Sandy Kerlin, Faye Massey, Mary E. Massey, Katherine Anne Meyer, Estelle “Pinky” Morgan, Neil Nelson, Kurt Nicaise, Pat Noll, Mick Noll, Deb Pille, Jeremy Ross, Tracey Ross, Nancy Slagle, Jackie Slone, Amy Thomas, Rosemary Topie, Danielle Walker, Tonya Wallace, Mary Ann Weiss, Brenda Zeckmeister, as well as over 100 youth and adult ceramic contributors. Scale: Five 3 foot square seating modules. Words are an important component of the design of the mosaic. At each All-Community or Core Design Meeting, the artist team wrote comments and ideas from community members on sheets of paper. Some phrases such as “Watch Out for Your Neighbor” were chosen deliberately because they can be understood in very different ways-- encouraging conversation at the seating installation and thus encouraging the creation of community. Other phrases such as “Dynamic History” are unlikely pairings of adjectives and nouns, evoking conversations about such issues as the need to rethink and rewrite our histories in order to have flexible, creative responses to current situations. In early discussions with community residents, an important theme that emerged was people’s interest in the varied architecture of their community. Gude decided to involve residents in creating images of favorite buildings in ceramic bas relief. Seventy five middle school students and over 50 adults created 136 homes and public buildings that held emotional significance for the makers. 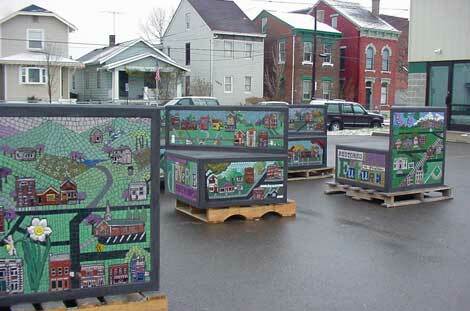 There are over two hundred handmade ceramic pieces in the Covington mosaic. Each piece had to be carefully wrapped and transported to her studio for bisque and glaze firings. “One of the amazing things about this project is the specificity of the tiny buildings. People often came into the studio and exclaimed, “Oh, I know where that house is.” or “I know who lives in that place; wait till I tell them!” One of the stimulants to community conversation as people sit together and look at the mosaic will be the discussing where the real life model for each house is located and how it has changed over time. The Covington Millennium Mosaic Workshop was a happy and busy place. For 9 weeks Gude and her Mosaic Assistants Jill Ruschulte and Ken Turner kept the workshop open 6 days a week, often 10 or more hours a day. Volunteers dropped in to work when their schedules permitted. Some came for several hours once a week. Others were able to volunteer frequently at irregular times during the day. It wasn’t unusual for someone to drop in wearing a gardening hat or business-dress work clothes, announcing, “I have two hours. What would you like me to work on?” Several talented local artists became engrossed and began spending every free hour at the mosaic workshop. The Mosaic Workshop had a hospitality table with coffee and tea and always stocked with donated treats from fresh local fruit to German sugared almonds to biscotti brought in from the artist’s Chicago neighborhood. A seating area at the front contained books, poetry, and articles written by project participants. A wall area was dedicated to posting newspaper stories about the project and about the other activities of volunteers. In the fall the workshop became a place for residents to trade plants and seeds. Typically, the entire design of a mosaic is completed before the work of executing the mosaic begins. In this case the large number of individual panels, the complexity of the designs, and the great amount of community input as well as combining ceramic and glass in a single work created the need to simultaneously design and create completed mosaics. This allowed for community volunteers who had become skilled in mosaic work and thus to understand the possibilities and limitations of the medium to participate in the final drawing of some of the panels. Discussions about how to create the look of Covington led to the observation, that in most community self-depictions in murals and mosaics it is always summer. It was decided that the Covington Millennium Mosaic would show the city throughout the seasons of the year--including such times as gray, rainy days and winter days with brownish grass and no snow. Along with depicting the seasons of the year, many of the urbanscape panels can be read symbolically to reveal some aspect of Covington life or history. In the large Fall scene, the Ohio River contains houseboats, the method used by many German settlers to come to the area. The Spring scene depicts roads leading from Appalachian mountains to the city. A Summer scene pairs railroad tracks with depictions of a library and the local high school, suggesting the African American immigration from the south to seek increased educational opportunities. As the mosaic workshop became fully operational, they calculated the square footage and recognized that they would need to create three panels a week in order to finish on time. Each Saturday became an exciting race as mosaic volunteers showed up to push the team to successful completion of its weekly goal. If the team had been content with basic, good mosaic work it could have finished in a more leisurely fashion. But as people’s skills grew so did their ambitions. The mosaic work became increasingly complex. Such things as birdbaths, gardens, and gazing balls showed up in urbanscape scenes. Within the letters and backgrounds of the text pieces, volunteers created increasingly intricate geometric designs and hidden images. The solid copper-colored background of the “Community” and “How Will We Grow?” panels are actually made up of dozens of 2” square designs--one by each participant in the mosaic process. For more images of the You Belong Here! project, visit the Artist and Communities section of the Mid-Atlantic Arts Foundation’s website.